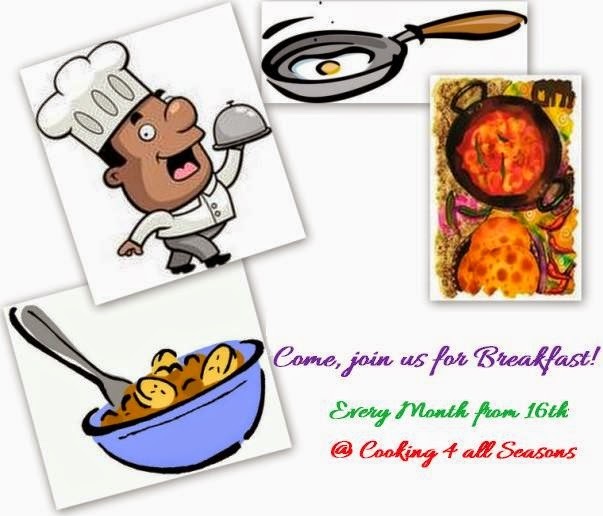 Cooking 4 all Seasons: Come, join us for Breakfast ~ June Event Announcement! Come, join us for Breakfast ~ June Event Announcement! After the first edition of "Come, join us for Breakfast", it's time for the next edition. The first edition round up will be shared soon. The list can be checked out in the list as of now. Planning to make different and new breakfast on regular basis has always been my interest. That's why my Breakfast dishes run a mile. I have readers asking for more ideas all the time. For the first couple of months, it will be about any breakfast, any country. Maybe some editions later, we can get more specific. So for now you can send across any breakfast dish you share on your blog. From now till July 15th 2014, cook any breakfast dish and link them in the linky tool! • Archive entries from May 2014 are accepted, provided it has a link back to this announcement.